Get hip to the groove! The 70's Preservation Society is dedicated to the music and memories of the 1970's. We proudly offer our streaming music channel, 70's Classics which streams all the greatest music of the decade to you in 128 bit for your listening enjoyment 24 hrs a day. The 70’s Preservation Society sponsors the 70's on Shuffle - A random mix of the whole decade! We also offer a live webcast with Jim and J.J. Thomas every Friday at 8pm central we call, The Class Reunion. You will also find a little about us, Jim and JJ Thomas. A few memories from my old radio show called 70's Saturday Night and some 1970's music history with Week In Music. Also some 1970's related website links for you to check out. To listen to the live stream you have a few choices, you can use the menu above to select Radio Show / Live Stream. 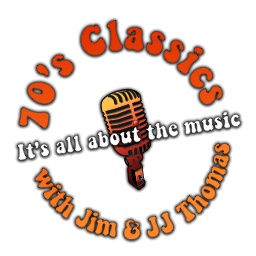 Or click on the 70's Classics logo found at the top of every page of this website. These clips are placed here for the memories of "70’s Saturday Night” and for those who remember the show and would enjoy hearing these small audio cuts once again. These are a behind the scenes clips of "The Class Reunion” show available as podcasts without the music. You’ll be able to hear what we talked about during the live shows.